Piso Fare 2019 Promos Until 2020: Piso Fare 2015: Latest Summer Sale! 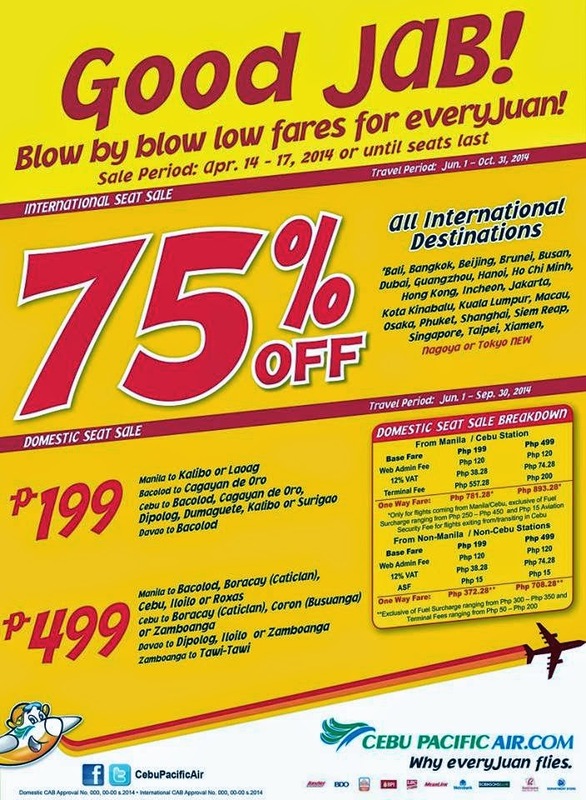 Piso Fare: After the Piso Fare seat sale a week ago, here's another summer treat courtesy of Cebu Pacific! All International Destinations are on 75% Off! Check it out below. For the rest of the Philippine destinations, the cheapest bast fare is at Php 199. #CEBseatsale! *Only for flights coming from Manila/Cebu, exclusive of Fuel Surcharge ranging from Php 200 – Php 550 and Php 15 Aviation Security Fee for flights exiting from/transiting in Cebu..
* Bangkok, Beijing, Brunei, Busan, Dubai, Guangzhou, Hanoi, Ho Chi Minh, Hong Kong, Incheon, Jakarta, Kota Kinabalu, Kuala Lumpur, Macau, Osaka, Phuket, Shanghai, Siem Reap, Singapore, Taipei, Xiamen, Nagoya or Tokyo NEW! 75% OFF discount is applicable on INTERNATIONAL fare are inclusive of 7kg hand-carry allowance. The following fees shall apply after discout: Php 120 Web Admin Fare, Php 120 Web Admin Fee, Fuel Surcharge ranging from Php 910 – Php5,005, Terminal Fees ranging from Php 450 - Php 550, Country Specific Taxes ranging from Php 403 - Php 1, 250 and check-in baggage. Quoted DOMESTIC one way fares are inclusive of Base Fare, Php 120 Web Admin Fee, 12% VAT, Php 200 Terminal Fee for flights transiting in or exiting from Manila/Cebu Station and 7 kg hand carry baggage allowance, but exclusive of Fuel Surcharge ranging from Php 200 – Php 550, Php 15 Aviation Security Fee for flights coming from Cebu and check–in baggage. Terminal Fees ranging from Php 50 – Php 200 for flights originating from non-Manila/non-Cebu Stations must be paid at the airport.